Muttenz, September 23, 2014 – Clariant, Haltermann and Mercedes-Benz have tested a fuel of the future in a fleet test since January: Initial results prove the high quality and excellent properties of sunliquid® 20 fuel (contains 20% ethanol coming from straw). With its first-class combustion properties, sunliquid® 20 improves engine efficiency so that its 4% lesser energy content, as compared to E10, is more than compensated. For drivers, this means: with sunliquid® 20, the sustainability of the fuel (reduced CO2 emissions) is increased significantly whilst consumption remains the same. In addition to first-class performance, the 50% improvement in particle count emissions of sunliquid® 20 in contrast to the EU reference fuel EU5 is notable. Furthermore, the cellulosic ethanol in sunliquid® 20 demonstrates especially high greenhouse gas emission savings of up to 95% across the entire value chain (well-to-wheel perspective) without competing with food production or agricultural acreage. Consumers could fill now their tanks with an eco-friendly fuel, one which can be introduced without making any adjustments to the gas station infrastructure in Europe and without compromising fuel range and driving comfort. “Our main task is to shape solutions to create sustainable mobility for the future. Gasoline with 20% ethanol can already be used easily in our latest Mercedes-Benz BlueDIRECT gasoline engines. The prior experiences from the pilot project are optimistic, as are greenhouse gas emission savings regarding efficiency. Hence cellulosic ethanol can make a significant contribution to climate protection, so making it for us a building block of sustainable mobility,” explains Peter Lueckert, Director for Engine, Powertrain, and Fuel Injection at Daimler AG. “Our joint project is evidence that Germany is a trendsetter in the research and development of sustainable special fuels. The use of outstanding biofuels is extremely important for sustainable, efficient and affordable mobility in the future. As a specialties company and research partner of the industry, we are even more delighted to be able to produce a fuel that can be used so broadly,” emphasizes Dr. Uwe Nickel, CEO of H∙C∙S Group (Halterman Carless Solutions). sunliquid® 20 is an E20 fuel with 20% cellulosic ethanol. Wheat straw or other non-edible agricultural residues are converted into cellulosic ethanol using Clariant’s sunliquid® process. The production of cellulosic ethanol is virtually CO2-neutral, saving almost 100 % of CO2 emissions compared to gasoline. Haltermann then mixes the cellulosic ethanol with conventional fuel components to form the new fuel sunliquid® 20. The 20% cellulosic ethanol gives the fuel a high octane number (RON) of over 100, guaranteeing optimal efficiency. In January 2014, Clariant, Haltermann, and Mercedes-Benz began the fleet test with Mercedes-Benz series vehicles. 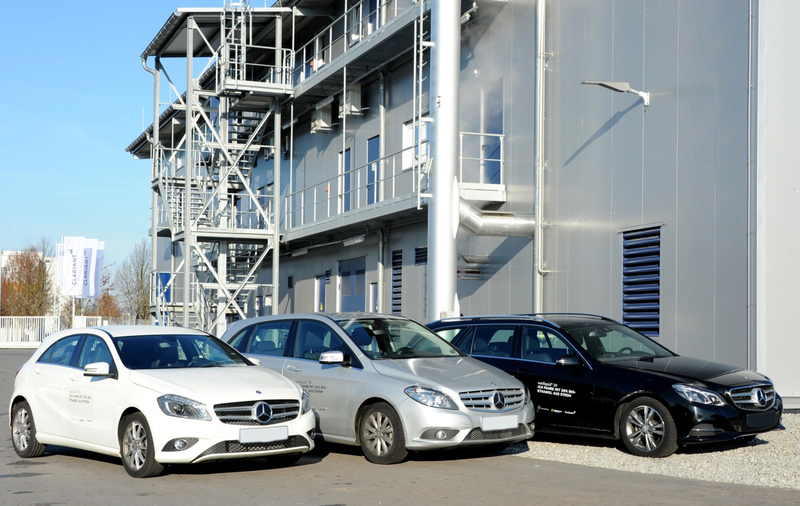 The test fleet vehicles can be refilled with the new fuel at a specially equipped gas station on the Mercedes-Benz site in Stuttgart-Untertürkheim for one year. The cellulosic ethanol comes from Clariant's sunliquid® demonstration plant in Straubing, where approximately 4,500 tons of agricultural residues such as wheat straw or corn stover are converted into cellulosic ethanol each year. At the Haltermann plant in Hamburg, the bioethanol is mixed with selected components to create the innovative fuel, the specifications of which reflect potential European E20 fuel quality. SUNLIQUID® IS A REGISTERED TRADEMARK OF CLARIANT IN SEVERAL COUNTRIES. sunliquid® is an innovative biotechnological processfor manufacturing cellulosic ethanol from agricultural residues such as cereal straw, corn stover or sugarcane bagasse. During the fully integrated process, highly optimized, feedstock-specific biocatalysts split cellulose and hemicellulose into fermentable sugars under stable processing conditions in high yields. The process-integrated production of biocatalysts offers flexibility and reduces production costs. In the next step, an optimized fermentation organism allows both C5 and C6 sugars to be converted into ethanol, so increasing the ethanol yield by around 50%. An innovative purification process developed by Clariant is instrumental in enabling all the energy required for the process to be derived from the insoluble residue lignin. The resulting cellulosic ethanol saves around 95% of CO2 emissions compared to fossil-derived gasoline. Since July 2012, Clariant has been operating a demonstration plant in Straubing, producing up to 1,000 metric tons of cellulosic ethanol from around 4,500 metric tons of raw materials every year. The total volume of the project in Straubing amounts to around 28 million EUROS, comprising investment of around 16 million EUROS and the accompanying research of nearly 12 millionEUROS. The Bavarian government and the German Federal Ministry of Education and Research (BMBF) have each contributed around 5 million EUROS to this and other related research projects. Daimler AG is one of the world’s most successful automotive companies. With its divisions Mercedes-Benz Cars, Daimler Trucks, Mercedes-Benz Vans, Daimler Buses and Daimler Financial Services, the auto manufacturer is one of the biggest producers of premium cars and the world’s biggest manufacturer of commercial vehicles with a global reach. Daimler Financial Services provides financing, leasing, fleet management, insurances, and innovative mobility services. The company’s founders, Gottlieb Daimler and Carl Benz, made history with the invention of the automobile in the year 1886. As a pioneer of automotive engineering, Daimler continues to shape the future of mobility today: The Group’s focus is on innovative and green technologies as well as on safe and superior automobiles that appeal to and fascinate its customers. For many years now, Daimler has been continually investing in the development of alternative drive systems with the goal of making emission-free driving possible in the long term. In addition to vehicles with hybrid drive, Daimler now has the broadest range of locally emission-free electric vehicles powered by batteries and fuel cells. This is just one example of how Daimler willingly accepts the challenge of meeting its responsibility towards society and the environment. Daimler sells its vehicles and services in nearly all the countries of the world and has production facilities on five continents. In addition to the world’s most valuable premium automotive brand Mercedes-Benz, its current brand portfolio includes the brands smart, Freightliner, Western Star, BharatBenz, Fuso, Setra and Thomas Built Buses. The company is listed on the stock exchanges of Frankfurt and Stuttgart (stock exchange symbol DAI). In 2013, the Group sold 2.35 million vehicles and employed a workforce of 274,616 people; revenue totaled € 118 billion and EBIT amounted to € 10.8 billion. The company was founded as Johann Haltermann Mineralöl AG more than 100 years ago in Hamburg. Today Haltermann is one of the leading suppliers of high purity refinery chemicals used in the automotive, pharmaceutical and cosmetics industries, the printing, laboratory chemical and electronics industries, and in plastics processing. Haltermann is an established brand in testing and specialty fuels for the automotive industry, for hydrocarbons used in pharmaceuticals and electronics, and for high purity pentanes, which are used as blowing agents in the production of polyurethane foams. The company is a prize-winning specialist in the production and testing of new fuels, and is an independent market leader in Europe in this domain. 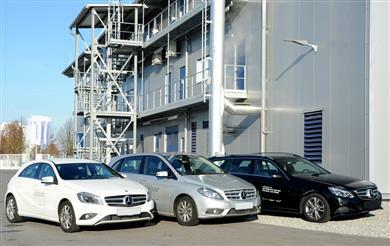 Cars from the Mercedes-Benz fleet at Clariant's sunliquid® demonstration plant producing cellulosic ethanol from agricultural residues.